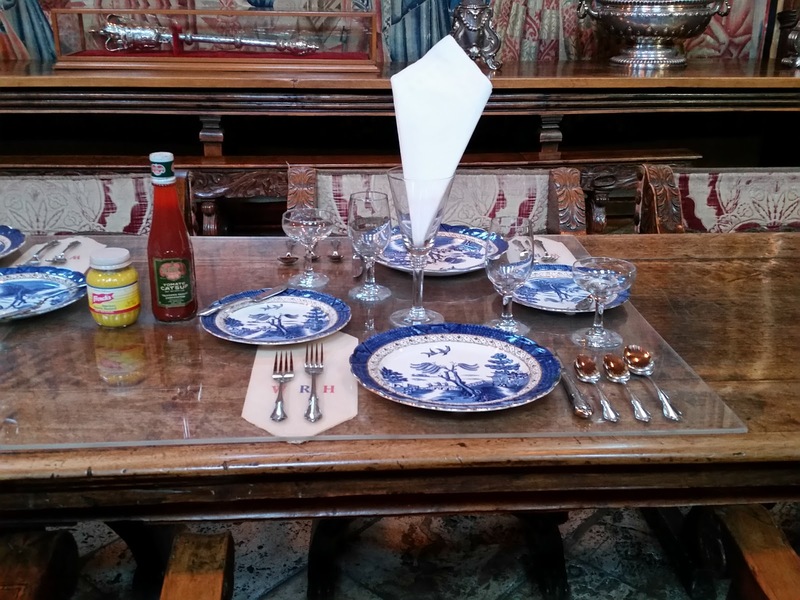 Notes: The Grand Rooms Tour ($25, 45min) is also recommended for first time visitors. The Wednesday travel day was by far our most beautiful travel day. The majority of the trip was spent driving through Big Sur. It was told to me that the Big Sur coastline is where many iconic rocky California coast pictures come from. Big Sur comprises the central coast of California and doesn't have much development through the area so it's just nature. The views driving through this area did not disappoint - the crazy turns and road cut out on the side of the mountain did though. Let's just say Patrick heard "honey, please slow down" more than he cared to. For this reason I would recommend starting the Pacific Coast Highway at a southern point and driving north. In our planning I had the foresight to recognize this as an issue but we had a wedding the weekend immediately after this trip that prevented us from doing this. 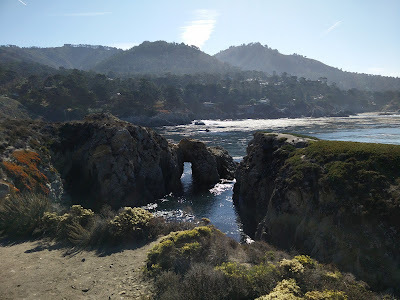 Before we got to Big Sur we ventured into Point Lobos State Natural Reserve which is a short drive south of Monterey and on our way to our next destination! Even though this was on the itinerary we started to skip it because we had another state park further south that we knew we wanted to stop at and figured they'd be about the same. We ending up stopping because we realized we were leaving so early (our bodies still hadn't adjusted to the west coast time difference) that we would be getting to our lunch restaurant at 10:30am and it didn't even open until 11am. And also a friend had highly recommended it! 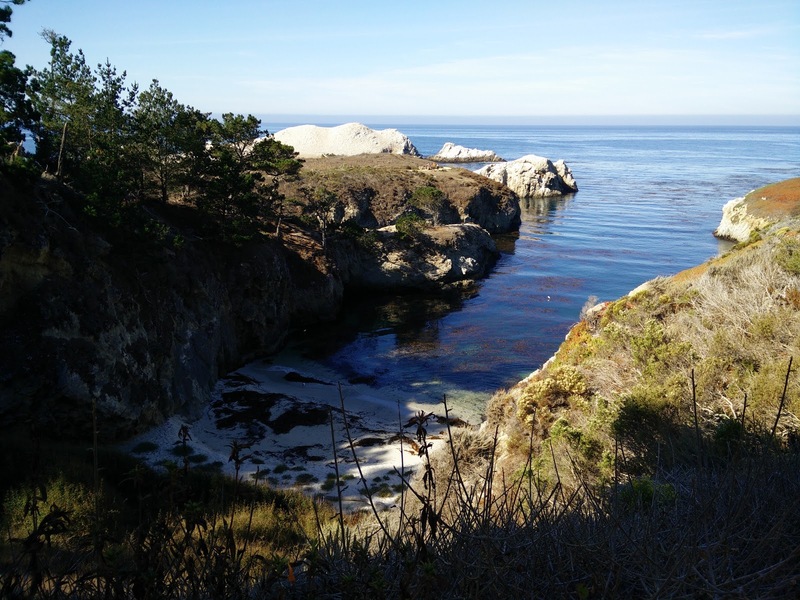 With this in mind we decided to stop at Point Lobos and kill a bit of time. The itinerary only gave us about a 20 minute pit stop. With about 45 minutes on our hands we walked along the meandering paths and trails and were not disappointed. See what I mean?! We walked along the South Shore Trail that took us up to Sea Lion Point and to see the Sea Lion Rocks. Guess what was on the Sea Lion Rocks?? Sea Lions! There were volunteers along the trail that had scopes set up on sea animals. We saw otters playing in the kelp and sea lions hanging out. One of the volunteers recommended stopping on our way out at a feature in the western part of the reserve called Bird Island. At this point we were still ahead of the itinerary and loved walking along the South Shore Trail so we decided to do it! We found the trailhead for the Bird Island Trail and set off along the path. The scenic views here were slightly different than the ones from South Shore Trail but were just as impressive. Oh ... and no birds on Bird Island! Finally we were all caught up with our itinerary although probably a little behind now because we were really enjoying our time in Point Lobos! I would venture that this was a top highlight of our trip and something not to be missed if you're in the area. 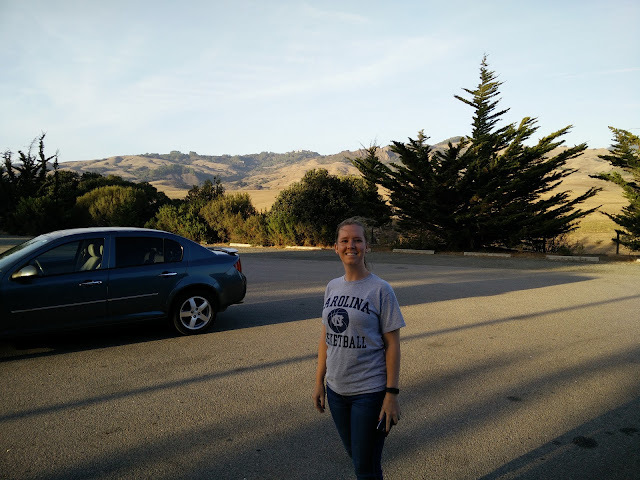 After Point Lobos our next itinerary pit stop was Bixby Bridge. If you've done any research into the Pacific Coast Highway you've probably seen a picture of this bridge. According to Wikipedia it is "one of the tallest single-span concrete bridges in the world and one of the most photographed bridges along the Pacific Coast due to its aesthetic design and location." Oops we didn't get a picture! This was by far the busiest turnout on our trip ... so busy we couldn't even get in the turnout to park. We made an in the moment decision that consisted of "oh it's just a bridge we can just keep going". So far I don't regret this decision. After our bridge blunder next up was lunch at Nepenthe. Something on google told me this was the best place to stop for food and views in Big Sur! As always google didn't let us down. 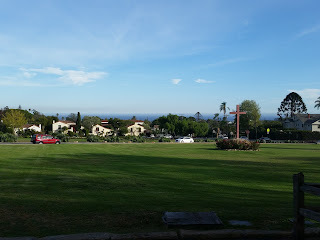 We had mountains to the left and the Pacific Ocean to the right. There was a bit of a wait once we got to the restaurant but they have a cute gift shop to walk around in and pass the time. 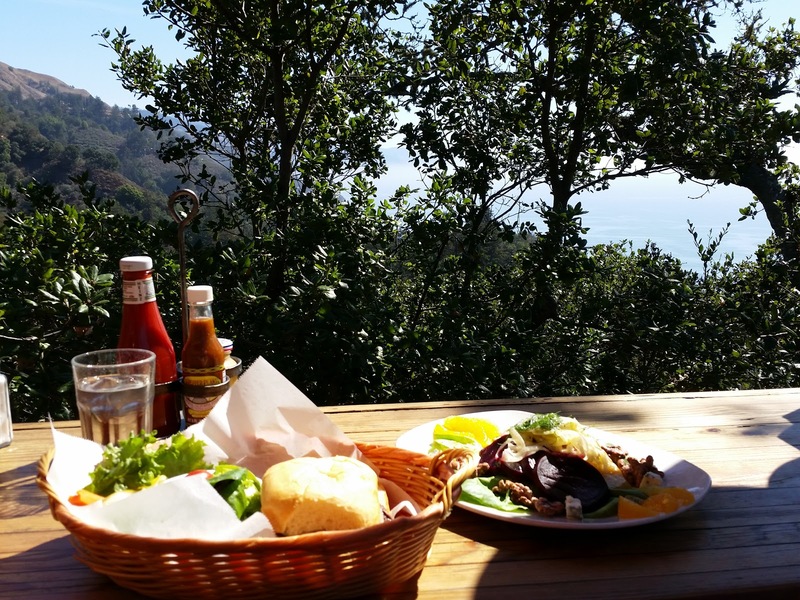 Full from our lunch we got back on the road en route to Hearst Castle with a pitstop at Julia Pfeiffer Burns State Park to see McWay Falls. 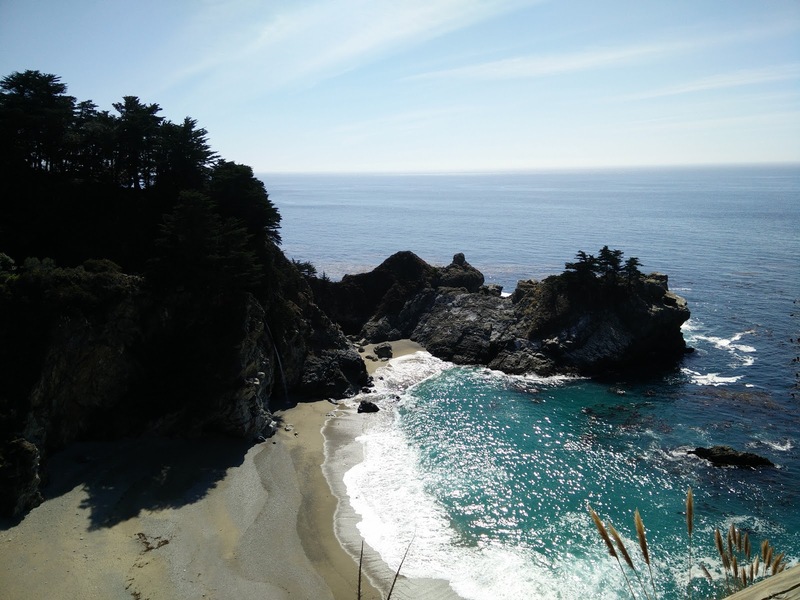 McWay Falls is considered a tidefall because it falls into the ocean. One website says it is the most photographed attraction of the Pacific Coast Highway. I imagine there are quite a few claims to that since this area is stunning - no matter where you stop! But McWay Falls was pretty cool. The parking lot for the park was full so we pulled off to the side of the highway. The trail is accessible from the highway and less than a 1/4 mile to an overlook of the tidefall. We probably spent less than twenty minutes on the McWay Falls trail since the overlook was such a short distance from the highway. The trail continued further to a "waterfall house" but we were about an hour out from our next destination and didn't have time to wander. By midafternoon we arrived at the glorious Hearst Castle! Hearst Castle is the mansion built for William Randolph Hearst, an American newspaper magnate who began his career in the late 19th century. If you're traveling along the Pacific Coast Highway this is kind of an in the middle of nowhere and you're probably wanting to take a break from riding so stopping here is a nice convenience. The estate contains 165 rooms and 127 acres of gardens, terraces, pools, and walkways. We toured the main rooms of the Casa Grande which is the main house on the grounds. We went through the assembly room, refectory, billiard room, and the theater. The gardens and pools are open to browsing after the tour. There are evening tickets offered that allow you to see the area as a guest of Hearst would have. 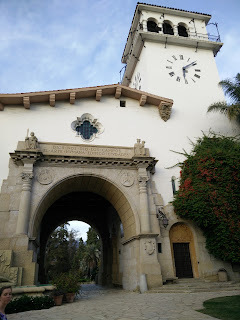 The heyday of Hearst Castle was in the 1920s and 1930s. During the evening tour the docents dress up in era attire and offer the immersive tour. Unfortunately this tour is only offered on select days and we weren't visiting on a select day which was a disappointment because I was really interested in it! 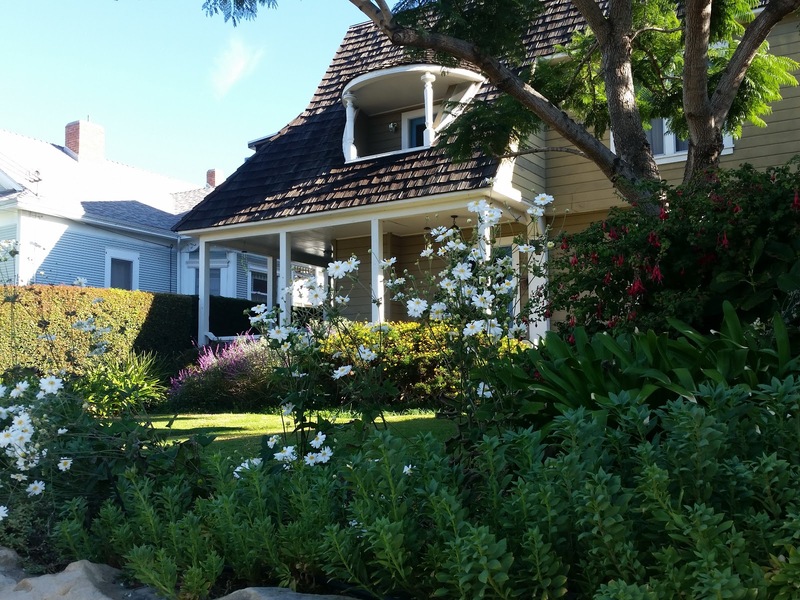 William Randolph Hearst affectionately referred to his estate as The Enchanted Hill. In the above picture you can get an idea for how big the hill was! The estate is sitting right along the mountainous horizon! There is a 5 mile bus ride to get to Hearst Castle. 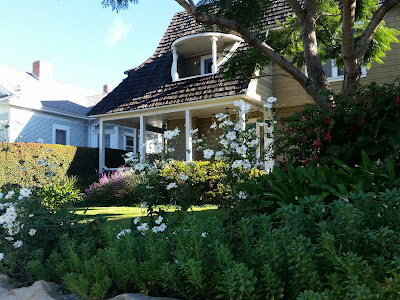 Our evening concluded with a late check in to the Bath Street Inn Bed & Breakfast in Santa Barbara and a quick trip to the closest In-N-Out for the raved about burgers! We both thought the In-N-Out was a bit over hyped. We chose the Bath Street Inn because they offered a wine tour package with Wine eDventures. Despite our late check-in we were up for our breakfast and ready to go at 10am for our wine tour. 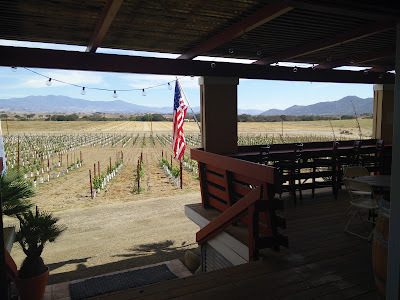 The wine tour was over the Santa Ynez mountains (about a 45 minute drive from Santa Barbara) and the wineries are located in the Santa Ynez Valley. Our tour guide was awesome - very informative about the local wine history and wine production as well. We've done a few tours before and are familiar with the production process but it's always interesting to hear about the history of an area and how the wine economy was established there. We visited three wineries and a fourth tasting room. 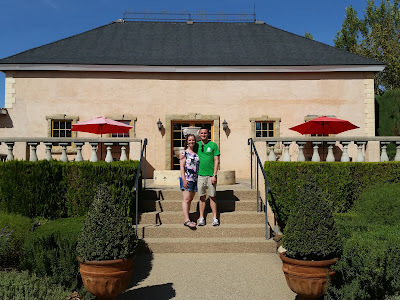 From their website: "Nestled under California pepper trees and overlooking the Alamo Pintado Vineyard near Solvang, Lincourt retains the rural charm and simplicity of an earlier era. Once a dairy property, the old farmhouse—an original 1926 Sears Craftsman kit home—serves as our tasting room. ... This area was largely unknown when the winery was founded in 1996, but today it is one of the most coveted, cool-climate AVAs in all of California." From their website: "Take an Australian-born winemaker, give him twenty years making wine in California and Australia... then add some of the best grapes from two continents and what do you get? An outstanding portfolio of wines from Santa Barbara County, California, Australia, Portugal, France, Spain and Italy. All created with pride, imagination and flair." From their website: "Wishing to make his own wines, and with a fondness for Santa Barbara, Fred and his family established The Brander Vineyard in the Santa Ynez Valley in 1975, where he quickly developed a reputation for making outstanding Sauvignon Blanc. Fred’s passion for this varietal has committed him to be California’s top producer of Sauvignon. With over 30 vintages “in the bottle,” he is a pioneer of the Santa Barbara wine country." 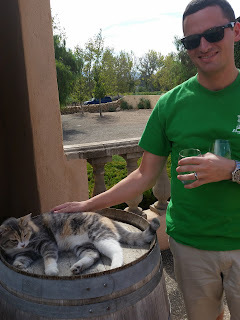 Brander Vineyard had a resident winery cat named Figgy so this was obviously our favorite winery! From the website: "A California resident since childhood, Bob Lindquist named his winery “qupé” to honor the Chumash, the indigenous people of the Golden State’s Central Coast and Channel Islands. Since many of the sounds of the Chumash language have been obscured by time, Bob gave “qupe” its pronunciation (“kyoo-pay”), with an accent on the final syllable." 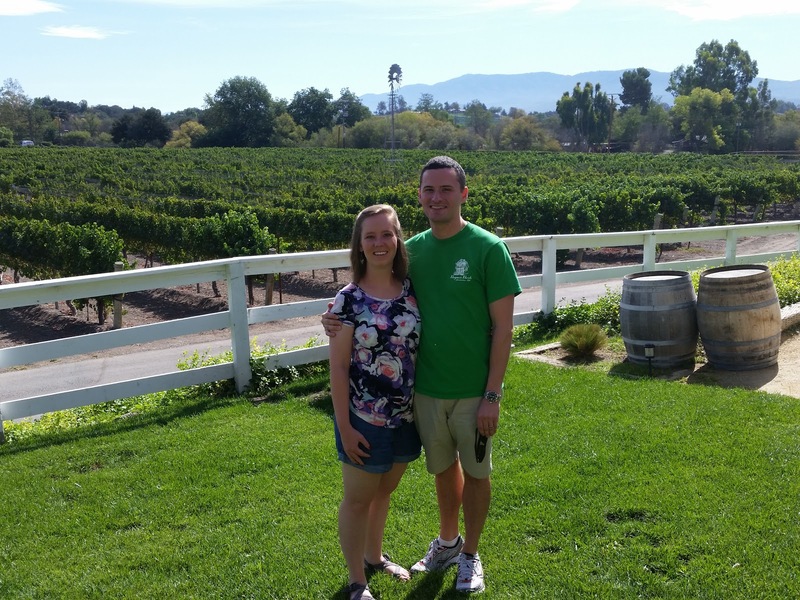 The wine tour concluded at the Qupe tasting room in downtown Los Olivos. I guess since there weren't any grapes around I didn't think it was worthwhile to take a picture. 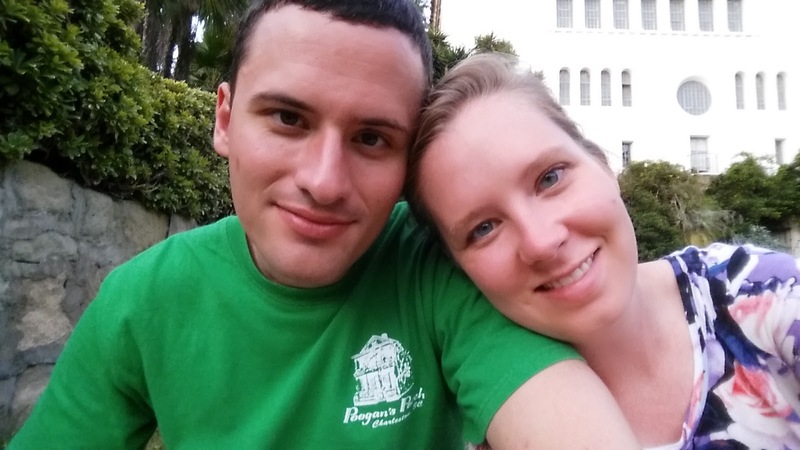 After the wine tour was over we decided to do some walking around Santa Barbara. 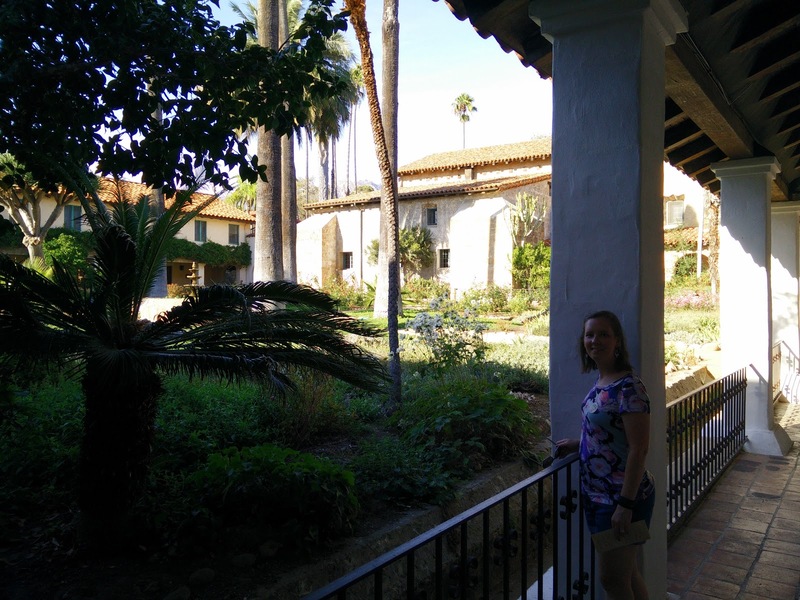 We headed to the Old Mission Santa Barbara and did the self-guided tour. This wasn't on our itinerary but the wine tour guide said we should go visit it when we asked him how we should spend the rest of the day. 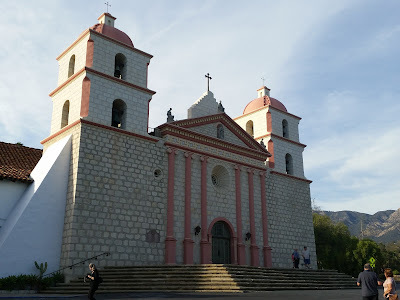 From the website: "The Santa Barbara Mission was established on the Feast of Saint Barbara, December 4, 1786 and was the tenth of twenty-one California Missions to be founded by the Spanish Franciscans. More than 200 years later, the Mission continues to be the chief cultural and historic landmark in the city of Santa Barbara. 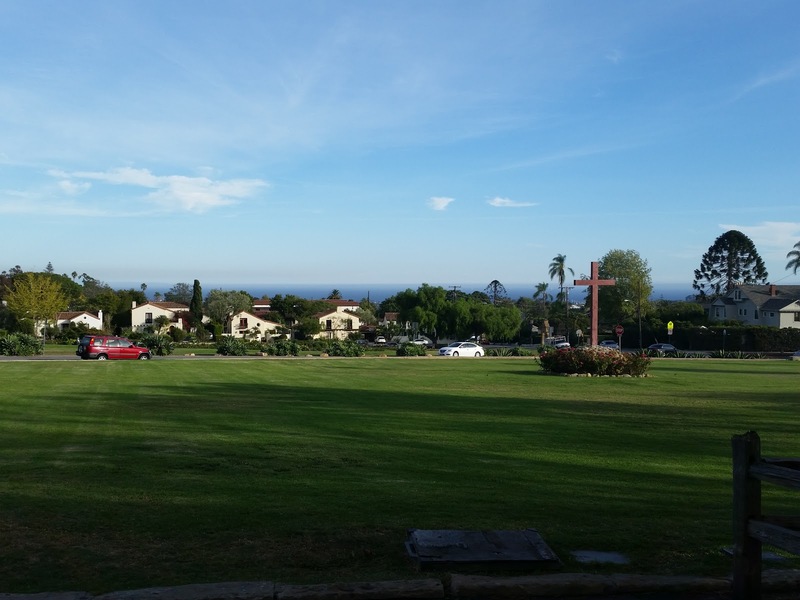 Home to a community of Franciscan friars, a beautiful church with a large and active parish; a museum and gift shop; a cemetery and mausoleum; and twelve acres of beautifully landscaped gardens. The Mission's commanding position and grand proportions, graceful lines and soft, blending colors all reinforce her title, Queen of the Missions." 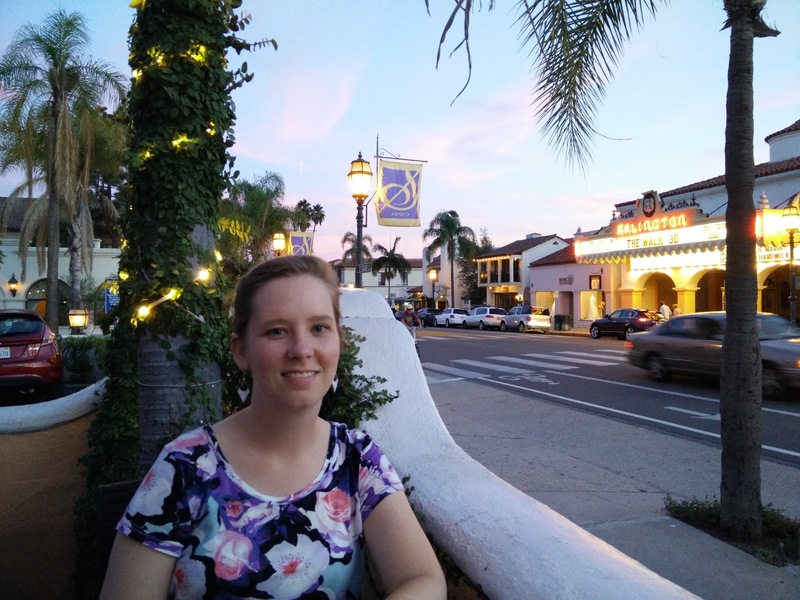 Our day was ending and we trekked over to downtown to see the Santa Barbara County Courthouse and have dinner as the sun set. There were all sorts of walking throughout this vacation! The courthouse is a gorgeous Spanish colonial revival style building completed in 1929. We knew we were there when we rounded the street corner and saw the clock tower. We used this time to take a break in the gardens and decide on a spot for dinner. Good time to take a selfie too. The evening concluded with an authentic Mexican dinner at Carlitos Cafe y Cantina in downtown Santa Barbara. 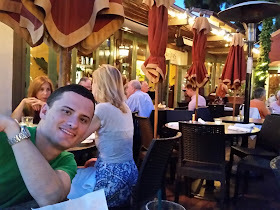 We were seated on their outdoor patio just as the lights were coming on throughout the city. Only one more stop to go - San Diego! All so beautiful. I know you did like the cat at the winery!